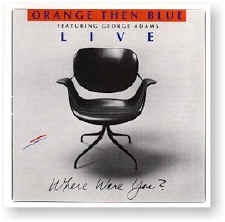 GM 3012 - Orange Then Blue: WHERE WERE YOU? On its first “live” recording, Boston’s most acclaimed little big band shows off the energy and groove that had made them local heroes. Joined by tenor sax late great George Adams, Orange Then Blue burns its way through over 70 minutes of music chosen from recent club and concert dates and recorded digitally. Where Were You? features music of Charles Mingus, Paul Motian, Miles Davis, Thelonious Monk (including the “scary” version of “Friday the Thirteenth“) and George Garzone. Recorded on (#2, 4, 6) 3 May 1987 at Villa Victoria Cultural Center in Boston, Massachusetts, (#3, 5, 7) 31 October 1987 at Ryles in Cambridge, Massachusetts, and (#1) 20 March 1988 at the Fitzgerald Theatre in Cambridge, Massachusetts.